It came across some viral pictures of a female APC supporter who chose a rather interesting way to enjoy her life. A yet-to-be-identified young lady decided to ignore all the troubles in life and enjoy herself in a rather interesting way. 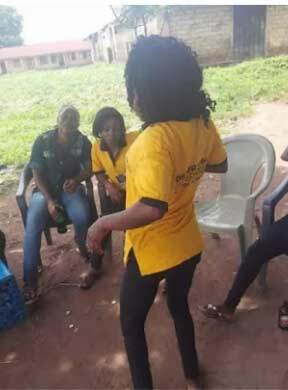 The young lady who appears to be a supporter of the ruling political party, All Progressive Congress (APC) was seen drinking a bottle of beer while dancing. The lady is assumed to be from Benue state, as she is seen wearing a yellow t-shirt with Governor Ortom's picture crested on it. The shirt also had the APC logo emblazoned on it. This is proper enjoyment!